Here are some images produced by renderers created for the RD framework. 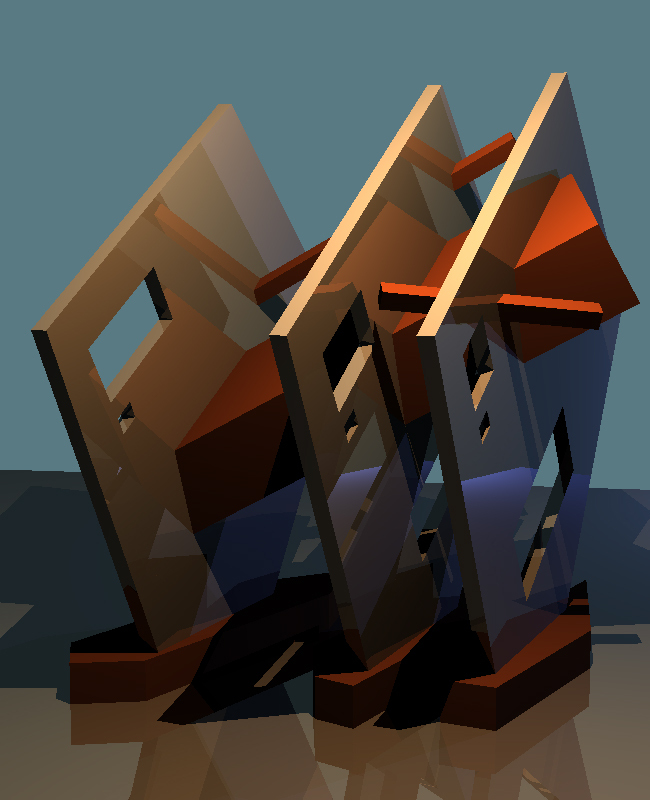 The images here were created by students in the NIU introductory computer graphics class using rendering engines of their own creation. Larger images can be seen by clicking on the thumbnails. RD scene files, when available, can be found by clicking on the "RD" next to the image. 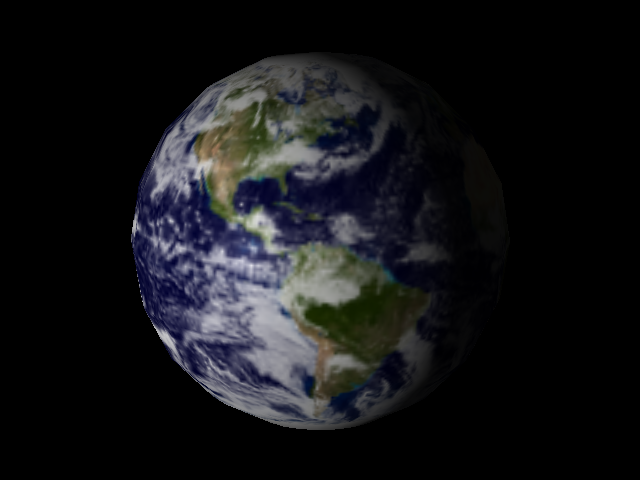 Some of the scene files here require texture data. RD This shows a simple example of flood filling. RD An animation using PointSets and PolySets. Nothing interesting happening here with lighting. 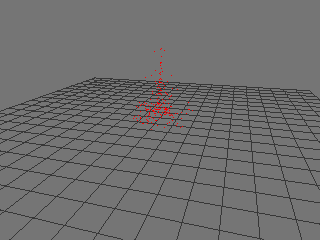 RD Another animation, using a particle system. RD Three colored FarLights. 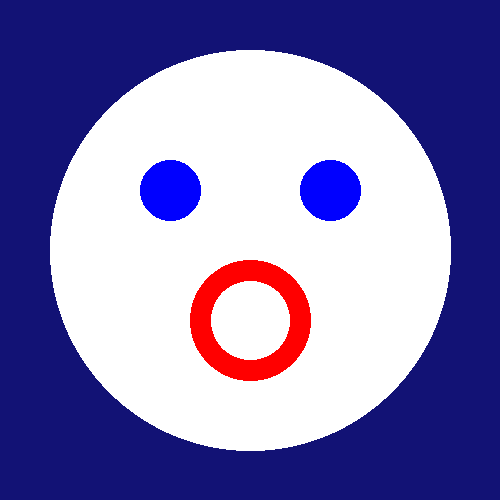 Also demonstrates the use of an OptionBool flag for interpolation effects (on by default). RD Three dim colored FarLights and a bright white PointLight between the spheres. 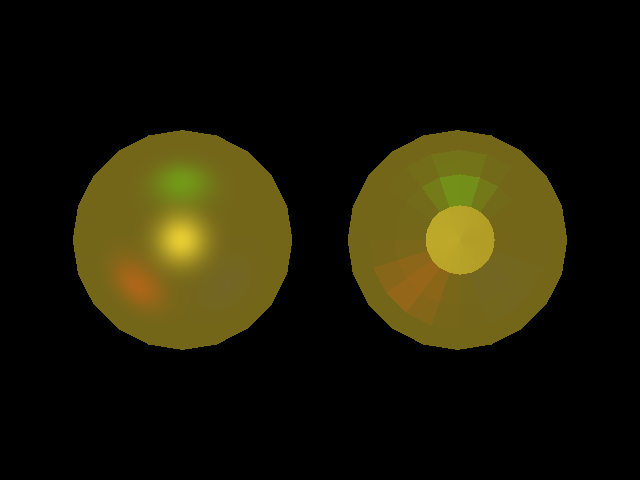 The setting of the interpolation flag is different for each sphere. 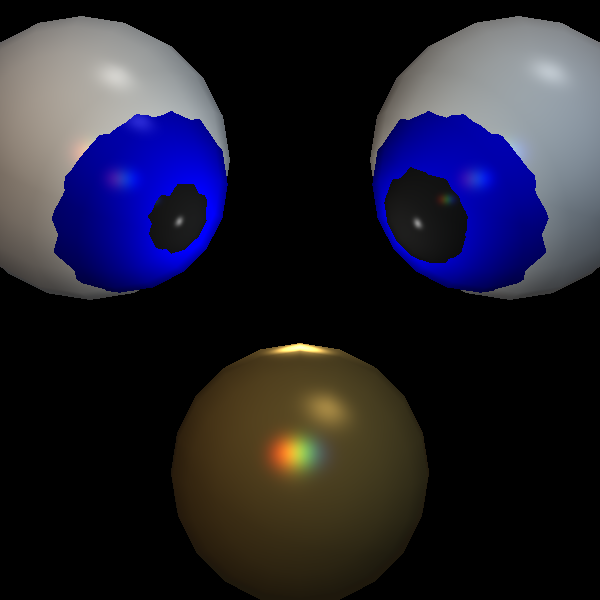 RD Two gold colored spheres using the built-in metalshader. Notice that the reflections of the lights are colored by the surface. 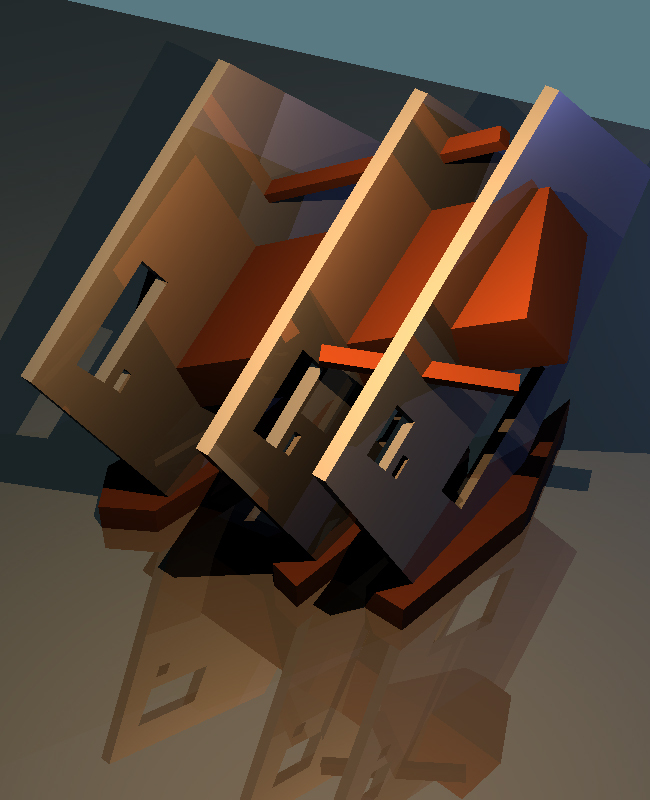 RD A detailed example of the built-in plastic shader, which gives control over a wider range of rendering parameters. 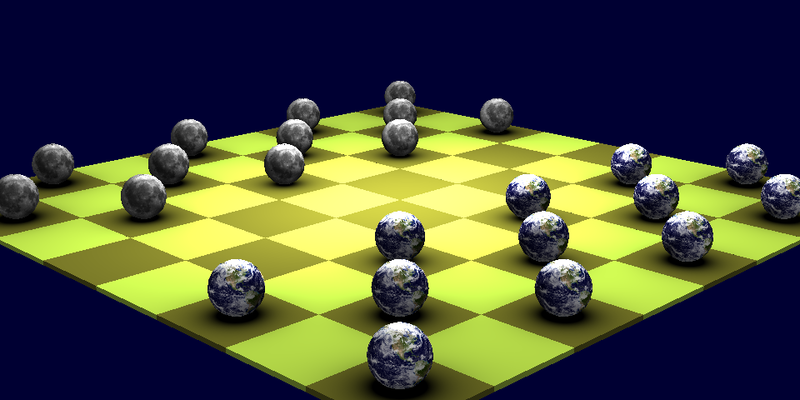 All of the spheres are white. 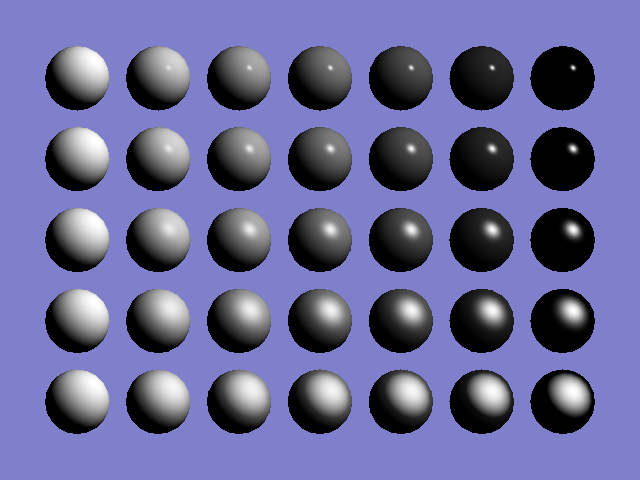 The specular exponent increases from 1 on the bottom row to 100 on the top row. 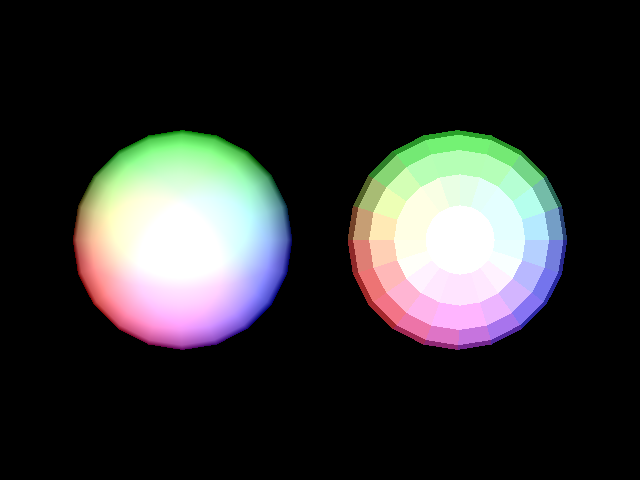 In the left column, the diffuse coefficient is 1.0 and the specular coefficient is 0.0. 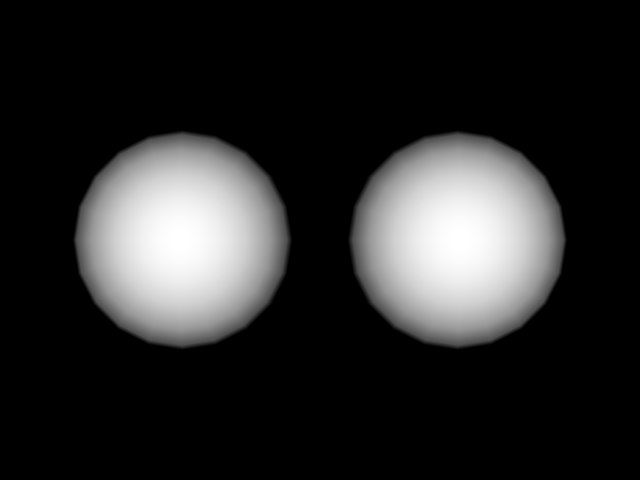 The diffuse coefficient decreases to the right while the specular coefficient increases. In the right column the diffuse coefficient is 0.0; the specular coefficient 1.0. RD A more elaborate example using some PolySets. 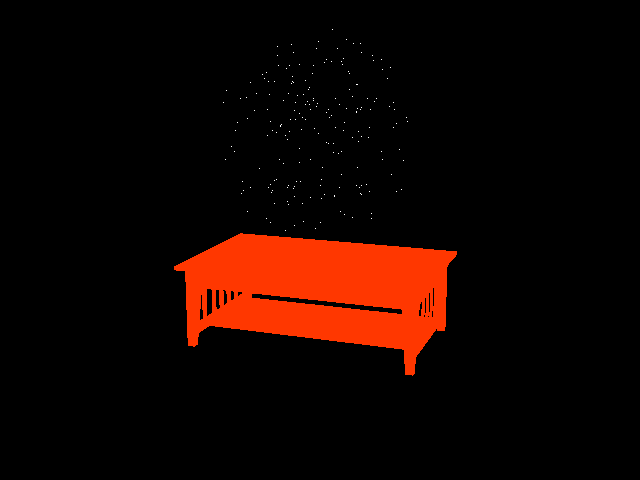 This particular renderer has no shadow capability. 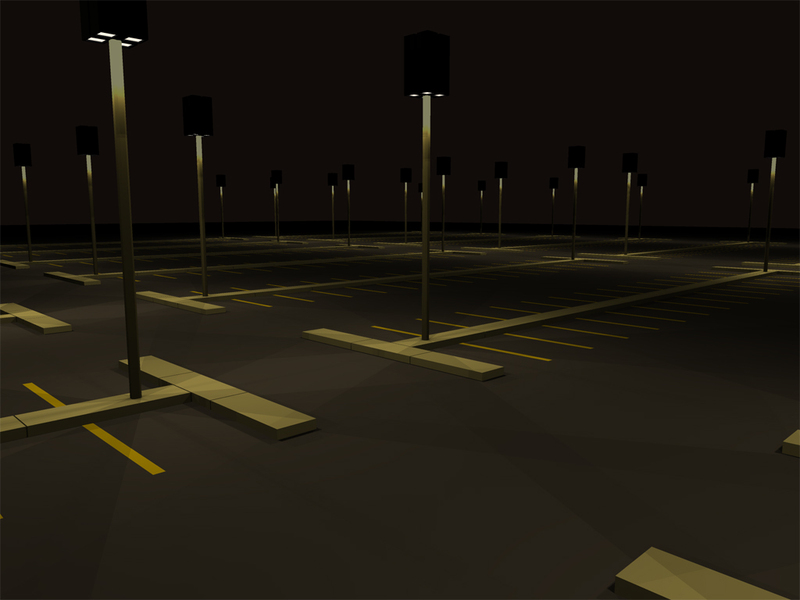 Consequently all surfaces are lit by all lights. There is a bright white light in the center of the scene surrounded by a small white sphere to give physical presence to the light. To make the scene more inviting, a point light is placed inside the object on each pedestal object with the light color matching the object color. This gives some color bleeding effects that would otherwise be very difficult to do. 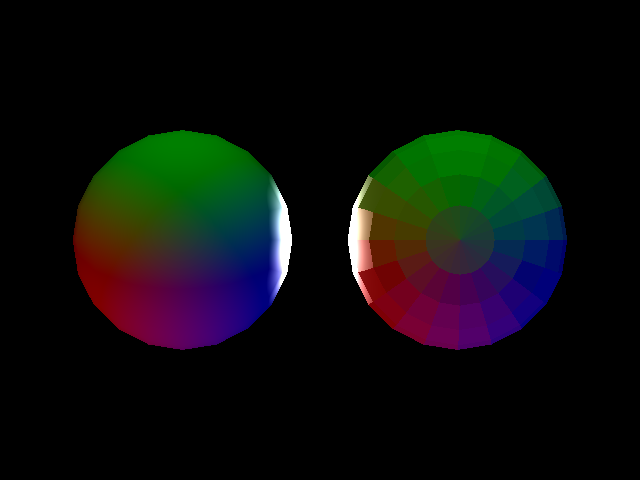 RD Intersecting spheres. 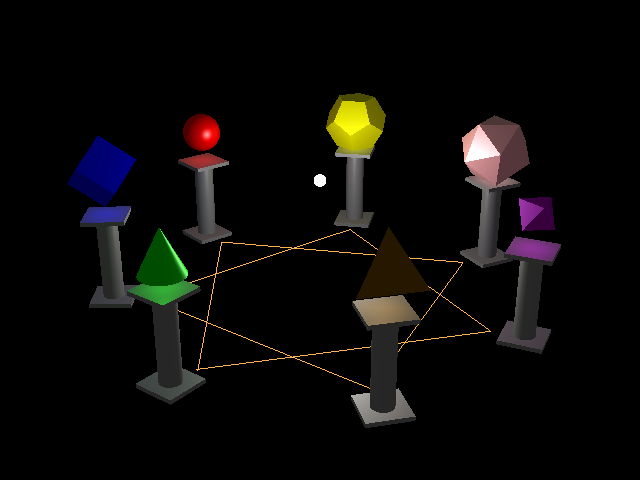 It's painfully obvious here that polygonal approximations are being used for the spheres. 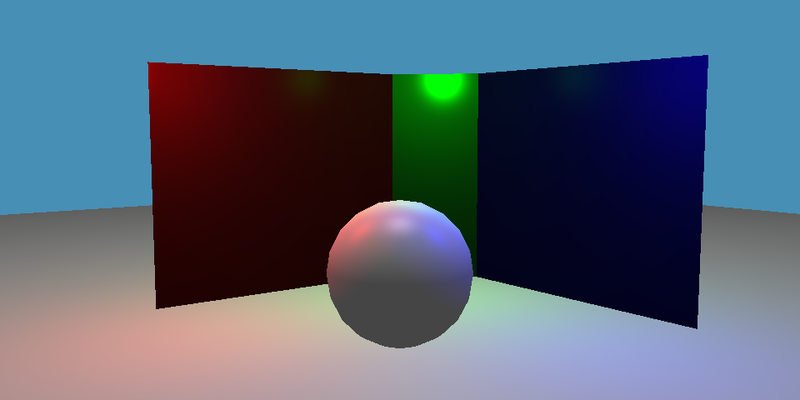 This would look very different in a ray tracer. RD This is a test image that is normally used with a ray tracing implementation. The lack of shadows makes it look that the sphere is floating above the ground plane when it actually is touching it. 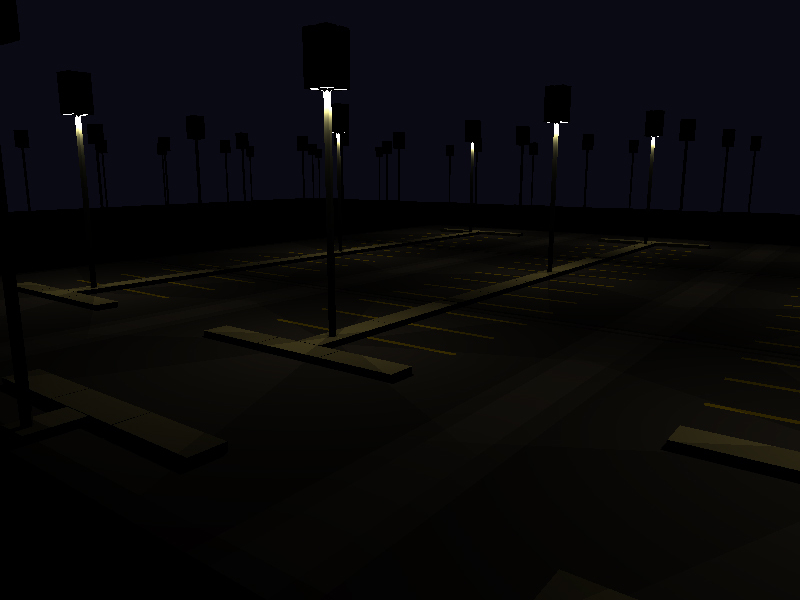 But given those limitations, the lighting effects are quite nice. RD An animation with texture mapping using the painted plastic shader. RD In addition to the one very bright central light source, each piece on the playing board has a "darklight" at its center, a light with negative intensity. 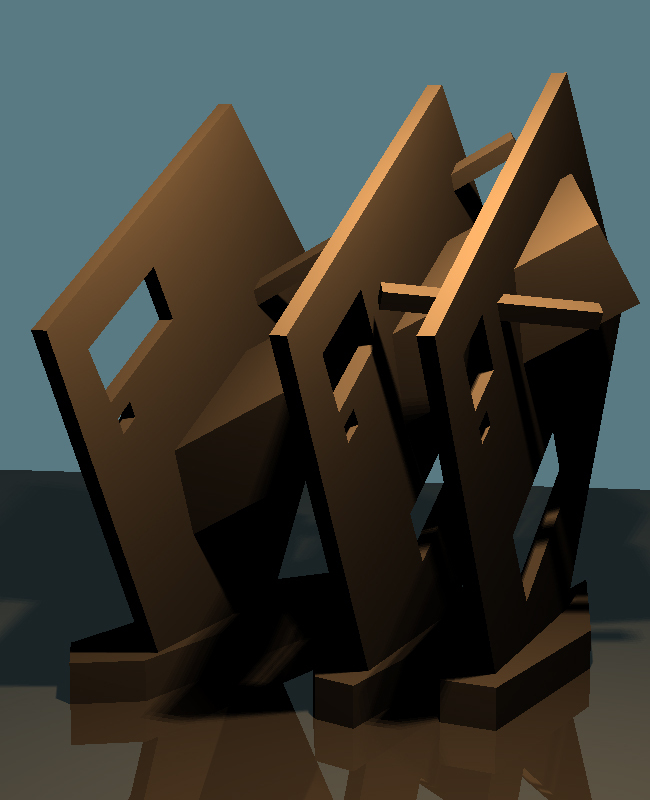 This is a nice hack for soft shadows and greatly enhances the realism of the scene. 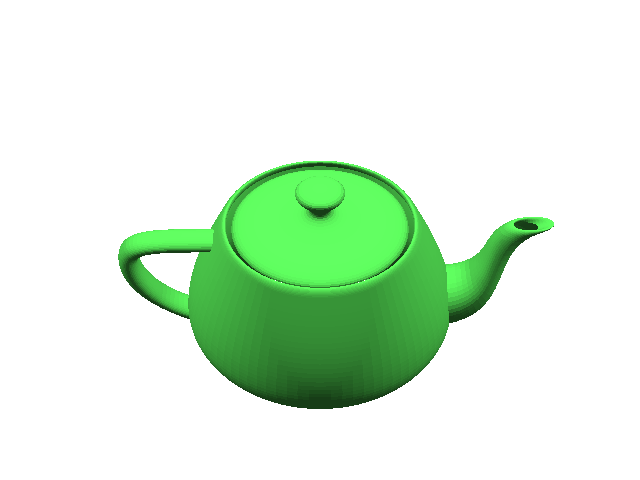 RD The venerable Utah teapot and an example of rendering Bezier patches. 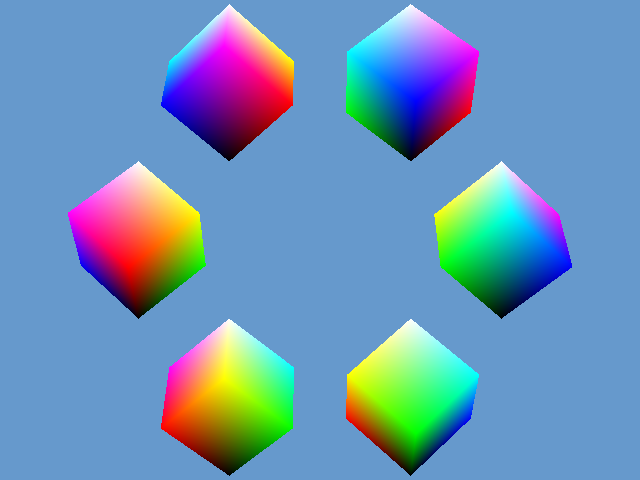 RD Six views of an RGB color cube. 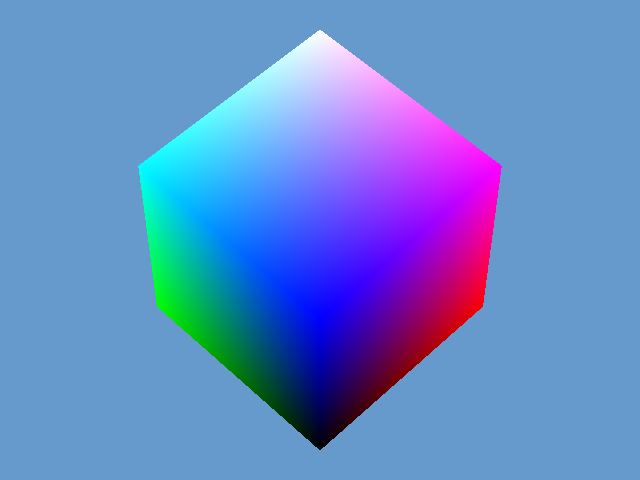 RD Animation of a rotating RGB color cube. Useful for explaining introductory color space concepts. RD The current logo of the NIU Computer Imaging Lab. 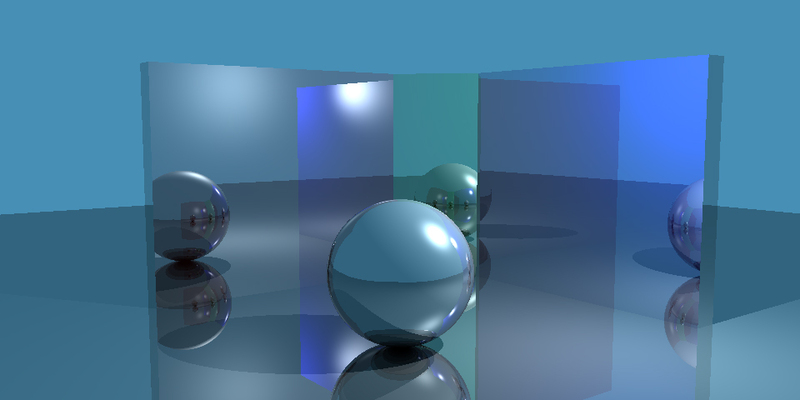 These images were created by Thomas Amberg using a ray tracer he wrote for the RD framework in 2007.